Ovarian cancer is one of the most dangerous cancers for women because it's often discovered in an advanced stage. Over 20,000 women are diagnosed with ovarian cancer each year, and half of them do not survive. Customized ovarian cancer awareness bracelets s can show support for a woman battling ovarian cancer, or can be used to promote general awareness. Messages such as “Team Jenny” or “Love | Hope | Faith” lets victims of ovarian cancer know they have support. Other messages such as “Find a Cure to Ovarian Cancer” or “Ovarian Cancer Walk 2014” can stand for general awareness or a specific event. September is National Ovarian Cancer Awareness Month, and the recognized awareness color for ovarian cancer is teal. 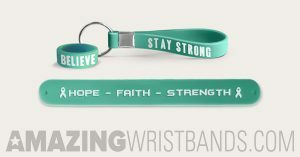 At AmazingWristbands.com, you can create your custom awareness bracelets online using teal wristbands, or a combination of colors. Swirl teal with white or pink for a unique look, or used segmented colors for a coll effect. If you're selling your ovarian cancer awareness bracelets, the more unique you make them to more popular they'll become.